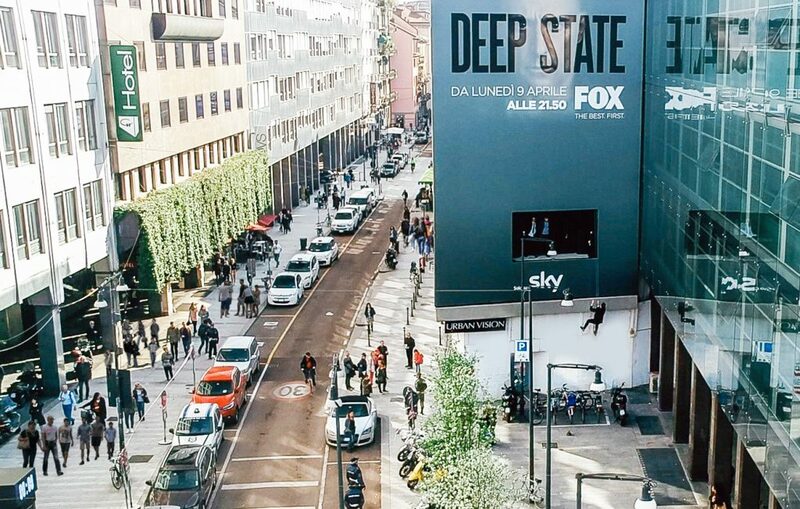 On the occasion of the launch of the first TV series produced in Europe by Fox “Deep State”, on air since April 9th, Largo La Foppa in Milan has been transformed for a week into an open-air set. From the 3rd to the 9th of April, twice a day, Urban Vision, the leading European media company in sponsored restorations, has staged in the neighborhood and within the maxi banner – converted for the occasion in a stage – chasings, kidnappings and spectacular actions, offering to the numerous pedestrians intense moments of entertainment and fun. Urban Vision revolutionized once again the use of advertising space recreating a real movie set and involving professional stuntmen. Twelve actors undercover, scattered among the crowd, suddenly took part every day in the staging, recalling the concept of the series, focused on the dichotomy reality-fiction, where ‘nothing and nobody is what it seems’.